Hugh enlisted at Buxton on the 31st August 1916 for the "Duration of the War". He was posted immediately to the Auxiliary Reserve until he was mobilised on the 19th October 1916. 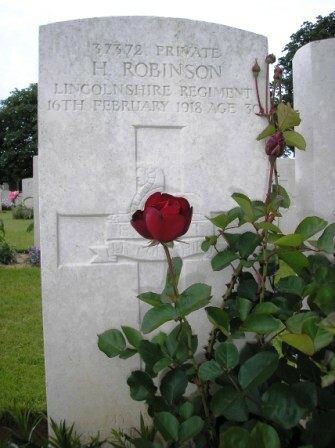 Strangely, he was again immediately posted to the Reserve until the 27th February 1917 when he was re-mobilized and posted to the 3rd Company, Labour Corps, being re-badged, Private 24961. On the 6th March 1917 Hugh was transferred to the 3rd Company, Labour Corps, and sailed from Folkestone on the 23rd March 1917, arriving later that day at Boulogne. On the 9th May 1917 Hugh was transferred again to the 42nd Company. His Service Papers indicate that he had been classified ".."C (ii) " ...", suffering from Arteriosclerosis, but on the 12th September 1917 he "… was classified "A" …". [Those who were classified as medical Category A went to Service Battalions, and Hugh was posted to L.C.B Depot at Étaples.] Thirteen days later, on the 25th September he was classified fit to rejoin his Unit, arriving the same day. Hugh was killed in action on the 16th February 1918. In total he had served just 1 year 170 days with the Colours. He now lies in Rocquigny-Equancourt Road British Cemetery, Manancourt, used by the British until March 1918, mainly by the 21st and 48th Casualty Clearing Stations posted at Ytres, so it is possible that Hugh was brought to one of these CCS from the battlefield. is buried in Favreuil British Cemetery.